Valentine’s Day is this weekend, and if you’re a procrastinator like the majority of the population, you’re cutting it pretty close. Cards and flowers just won’t do. Add extra personality to your Valentine’s Day gift this year by getting a yummy bouquet of flowers! You don’t have to work at Edible Arrangements to impress that special someone. Instead, check out this simple and inexpensive DIY! 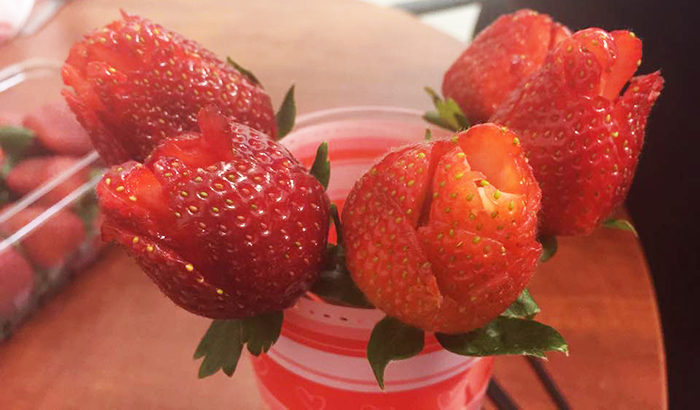 Note: The number of strawberries and stirring straws you will need depends on how many flowers you want in your bouquet. You can make as many or as few as you want. Keep this in mind when choosing the vase. The larger the vase, the more flowers you’ll need to fill it. First, wash your hands and the strawberries before beginning. We don’t think your Valentine would appreciate receiving germs instead of a yummy gift this Valentine’s Day. 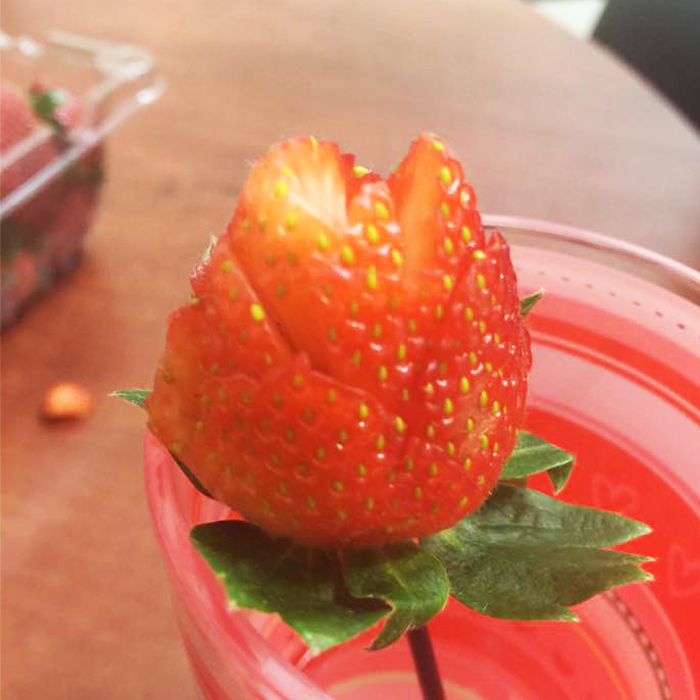 Next, take a strawberry in your hand and create the outer petals of the flower. Make four cuts toward the bottom of the strawberry. The cuts should encircle the bottom of the fruit and be driven down toward the stem. Make the next layer of petals by working upward on the strawberry. Cut the petals so that they fit in-between the petal on the previous level. Continue this until you’ve reached the top of the strawberry. Drive your knife slightly downward through the top of the berry to create the final petals. There you are! Your very own edible rose. Stick your stirring straw or skewer through the bottom of the strawberry to create a stem and place it in your festive vase. Continue this process until you have the desired amount of edible flowers.